3 April 2009. Dalian Maritime University (DMU), the renowned Chinese institution, has chosen an MAN B&W 5S35ME-B9 engine for its maritime laboratory. DMU has selected MAN Diesel’s cutting-edge, electronic ME-B engine to strengthen the practical tuition of its student body. The university will thus establish a fully functional, shore-based engine room at its Dalian campus. DMU’s maritime science faculty consists of a training dock and over 40 laboratories for teaching, training and research. The university’s modern array of equipment includes a full mission ship-handling simulator and an engine-room simulator. DMU also owns and operates a 10,000-dwt ocean-going training vessel that is powered by an MAN B&W 7S35MC engine and an MAN Diesel Alpha CP propeller. 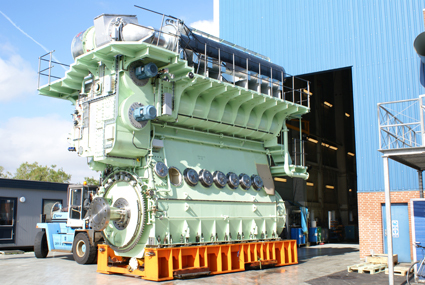 The engine will be built in Korea by MAN Diesel licensee STX Engine Co., Ltd. – logistical and capacity issues in the Chinese market meant that a domestic builder could not be sourced. In this respect, the Dalian offices of MAN Diesel and STX showed great cooperation in smoothing the path for setting up the deal. MAN Diesel will offer support to the new venture with both technical and commercial backing. Ultimately, the new engine will enhance knowledge of the company’s technology within the Chinese maritime community. DMU is one of China’s largest, maritime universities and is the only key maritime institute that operates under the patronage of the People’s Republic of China’s Ministry of Communications. DMU enjoys a glowing reputation internationally as a centre of excellence for maritime education and training, and has been recognised as such by the International Maritime Organisation (IMO). The university’s origins can be traced back to the early 20th century. DMU formally came into being in 1953 through the merger of three regional, nautical institutes. Since then, DMU has educated and trained nearly 50,000 students, many of whom play essential roles in maritime life within and outside of China. Each year, the university receives 600 students for its Bachelor of Marine Engineering course plus 1,500 students for the Diploma course. DMU also accepts 1,200 domestic and foreign marine engineers annually that take post-graduate courses on their path to becoming chief engineers. DMU’s current student population is currently c. 17,000.